Beautiful and Spacious Calabay Par Villa with Free Wi-Fi, Outside Grill and Nice Private Pool! This lovely and spacious villa is great for a big family or group of friends! Amazing living room with soft leather furniture is awesome place to hang out while watching TV. House features game room for fun time and kids entertainment. Two master bedroom suites is great plus of this home! Villa has outside grill for BBQ lovers and crystal clean pool, facing luscious greens is amazing spot to enjoy the sun. Villa is located in the Calabay Parc Community. 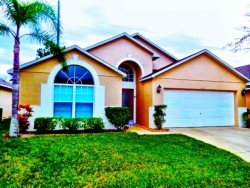 Calabay Parc vacation rental community is just minutes from some of the best shopping, popular restaurant chains, groceries and of course Disney Park (10 minutes)and attractions!We are also surrounded by some of florida's finest golf courses! If you seek for a beautiful and cozy place for your family get-away with convenient location this villa is a way to go!